My name is Alan Bryne and along with my brother, Lawrie, we manage Fassfern Mussels Ltd.
Our farm is based on the West Coast of Scotland, near Fort Willian, Inverness-shire. The farm started producing mussels in 1999. The thing I love about my job is looking after the farm and working on new innovations to create a great crop of high quality mussels. My future goals are to look into optimising mussel growth and quality by using different farming locations for different growth stages. 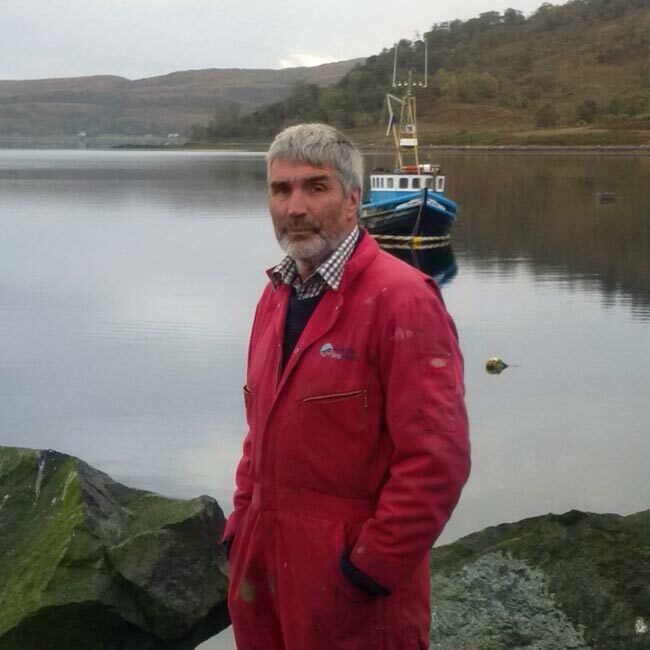 My name is Gordon Turnbull and along with my Dad (Nick - who has recently retired from the farm but still helps out now and again) we manage Isle of Mull Oysters Ltd. The family home I grew up in is right next to the sea on the North West coast of the Island of Mull. The oyster site we have near our home can sustain 3 million oysters in various stages of growth. The farm started producing small quantities of oysters in 1990, but I came onboard in 2010. Business wasn't exactly booming in the 90's for oysters but since consumers are being more adventurous they have created a demand that occasionally outstrips supply. Our farm joined Scottish Shellfish as a member in 1995, and has benefited immensely from being part of this group. The thing I love about my job is when the sun is shining and I am working outdoors on the beach, however the worse thing is working outdoors in a northerly gale! My future goals are always to produce the best oyster we can, to find solutions for any difficulties and constantly improve what we do. My name is Nick Turnbull and along with my son Gordon we manage Isle of Mull Oysters Ltd. I live next to the sea on the exposed NW. coast of the Island of Mull. The oyster site is just below my house and it always gives me great satisfaction to think that this small part of the shore can sustain 3 million oysters in various stages of growth. Since 1970, I have made my living from the seas around our Island, fishing mainly for lobsters crab and prawns. My younger son Kenny now continues this as his business. However the oysters became the focus of our busines. Now Gordon, who has an MSC in Marine Resource Management drives the business forward into the 21st century and the future looks good. My fishing partner George Martin and myself started producing small quantities of oysters in 1990. At that time there was no point in producing any real quantity as there was a very limited UK market. Move on 25 years and this has all changed, with consumers being more adventurous creating demand that occasionally outstrips supply. We joined SSMG as a member in 1995 as this afforded the best chance to expand with like minded individuals. I have been a director and vice chairman of Scottish Shellfish and have witnessed the steady growth of this cooperative from its early days in a portacabin at Loch Fyne to its present, up to date factory in Bellshill. I have always believed in the concept of "cooperation" and am proud to have played a very small part in the success of this unique shellfish cooperative. George retired 5 years ago and now myself and Gordon run it as a family business. 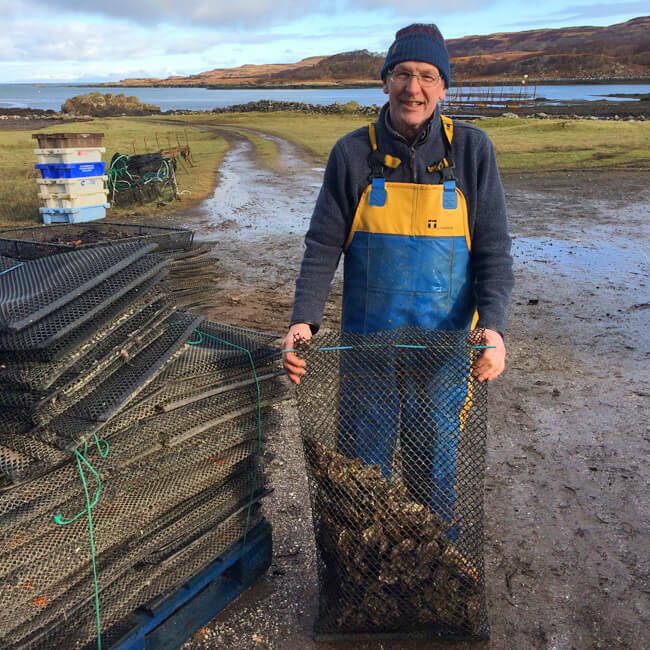 Our own oyster farm has developed alongside the growth of Scottish Shellfish and now produces in excess of 1/2 million marketable oysters each year and our aim is to continue to grow our farm alongside the expectations of the Scottish Shellfish market. I believe that with careful husbandry and in the right place, Scotland can produce a quality oyster second to none. We have and will make the necessary financial and time investment to make Isle of Mull Oysters one of those Scottish farms that produce these quality oysters. 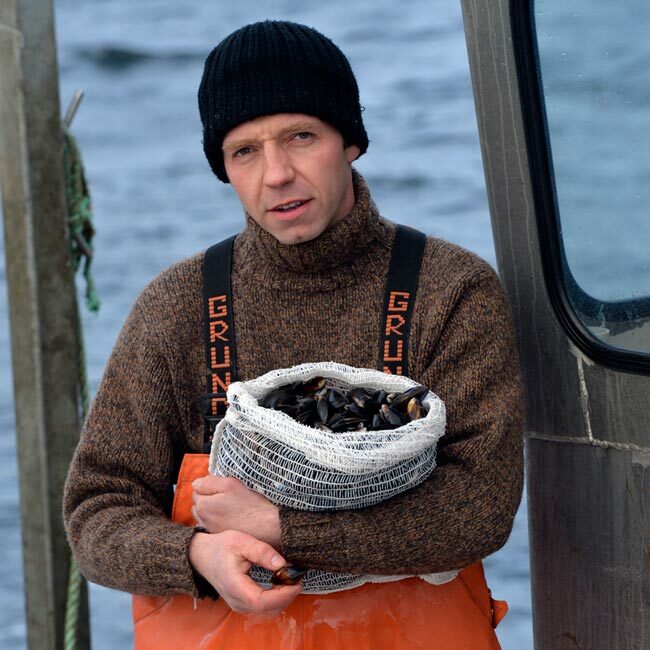 I am Michael Tait and I am Chairman of Scottish Shellfish and a mussel farmer. With my brother Richard and my father Lollie we started our company back in 1997 as an add-on to our Salmon farm business which we had started back in 1988. Our Mussel Farm is Shetland Mussels Ltd and we are based up in Shetland. In 2010 we moved out of salmon farming and now focus solely on producing mussels. We grow over 1000 tonnes of mussels per year which we are very proud to supply to the Scottish Shellfish who prepare them to send onwards to our customers. This works well for us and allows us to focus on our farming operations which are quite intense at times. We employ 17 people year round to help us build our mussel lines, set moorings, deploy spat (young mussels) collectors, grade and thin spat down, inspect stock and finally harvest and ship to the mainland by ferry. We do these on areas of sea we refer to as sites which we gain planning permission for from the local council and receive a lease from the Crown Estate to operate. Each site will have a number of long lines – up to 440m long and from these we suspend our mussel droppers (ropes) where we grow our mussels suspended above the seabed. We have built up our farm over the past 18 years so that now we have 24 sites around Shetland and we harvest around 54 lines per year now which to put in context is around 600,000m of rope with mussels attached to them. We still get a great buzz from producing our shells for the market each year and whereas Shetland can have its challenges due to weather it remains a great place to live and grow shellfish. 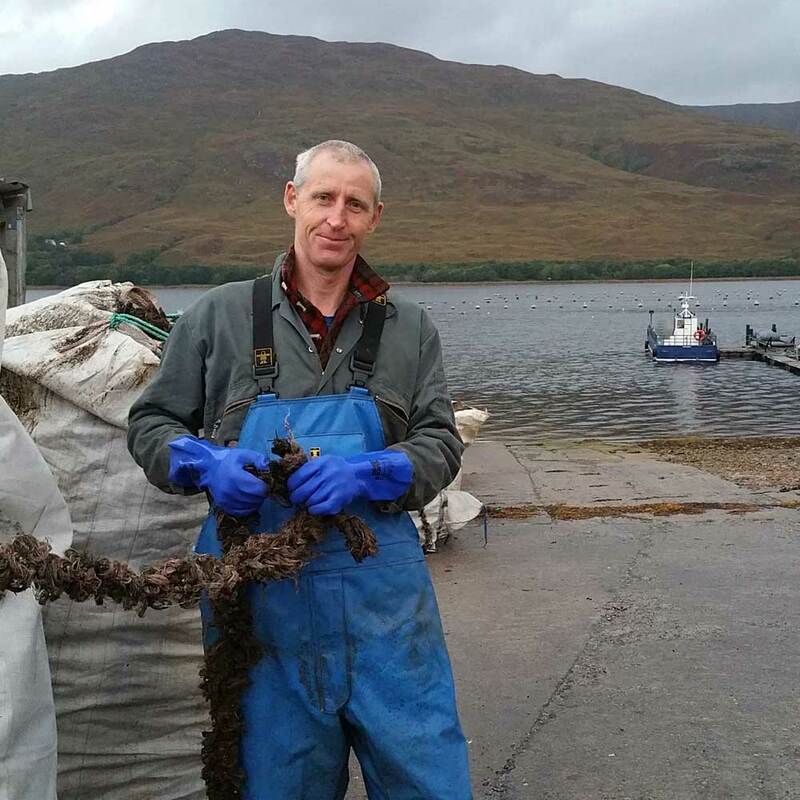 My name is Douglas Wilson and mussel farming is an integral part of our family life. The sea has always been in my blood and I have been a lobster and crab fisherman since the late 1970s. About 25 years ago, while still fishing, I decided to diversify and do some small-scale mussel farming near our family home by Loch Spelve on the Isle of Mull. Mussel farming was relatively new in these days and we learnt a lot by trial and error. The operation has gradually grown over the intervening years and I am delighted that my son Ben also now plays a vital role in running the business. 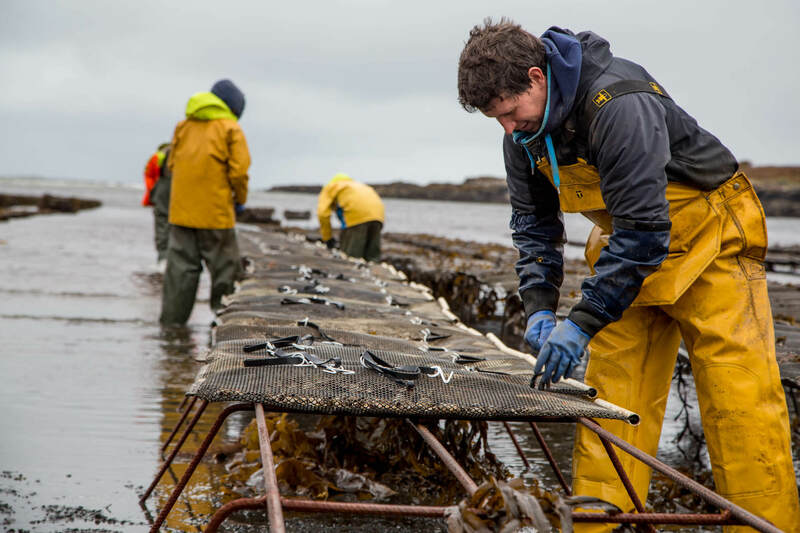 We employ about five people directly on the mussel farm, which might not seem a lot - but for a fragile rural community such as Mull, it is very significant indeed. Our farm is managed by Cameron Maclean, a local man who does an excellent job in ensuring the operation is run efficiently. Our harvest rates can vary depending on the circumstances, but we usually produce somewhere in the region of 300 to 500m tonnes of high quality mussels every year. I get huge satisfaction from cultivating mussels and am always amazed at how natural this form of food cultivation is. You put your clean ropes into the sea and after a year there can be 50 tonnes of mussels growing on them! The young mussels have settled naturally on the ropes and thrive by feeding on plankton in the water. You can’t get any more natural than that! We take great pride in the quality of our Scottish mussels and it gives me real pleasure when I see them getting served in a pub or restaurant.